On 24 April 2013, an eight-story building collapsed in Savar, near the Bangladeshi capital Dhaka, killing more than 1,100 people. 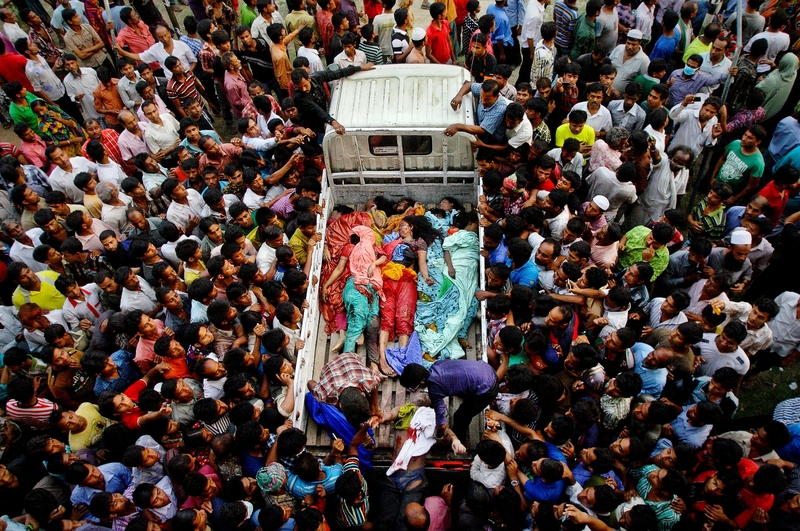 They are found of her relative’s death body on 2nd day of the Rana Plaza building collapse. The numbers of victims initially buried without identification, prior to the DNA test results, were 291. Rana Plaza, which housed five garment factories, had been designed with only six stories and intended for shops and offices only. Two further stories had been added, and the collapse was in part blamed on the weight and vibration of the garment factories heavy machinery. Rana Plaza had been briefly shut down the day before, when cracks appeared in its walls and pillars, but factory workers had been called back in, hours before the building fell. Rescue operations took nearly three weeks. Workers in Rana Plaza made clothes for popular Western brands. The disaster highlighted the hazardous conditions workers face in Bangladesh’s 16 billion garment industry, where many are paid as little as 30 a month. Only a few of the brands using the factories attended a meeting of the world’s largest retailers in Geneva, in the aftermath of the Rana Plaza collapse, and four made contributions to a compensation fund for victims and their families. Sasa Tomic 10... FAV! - SUCH AN AMAZING SHOT!